Happy New Year, my friends! Curious mind wants to know if you did anything fun and interesting last weekend. We got to spend some time with family, and being the nerd that I am, I also worked on and completed a book proposal. 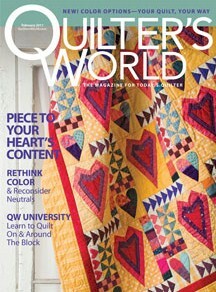 Have you picked up your February 2011 copy of Quilter’s World? 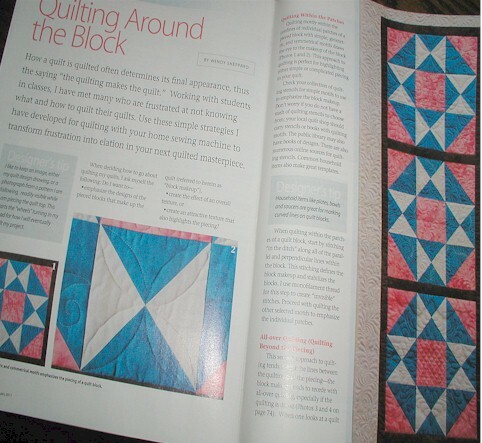 Well, you see… my Quilting Around the Block article is in it! 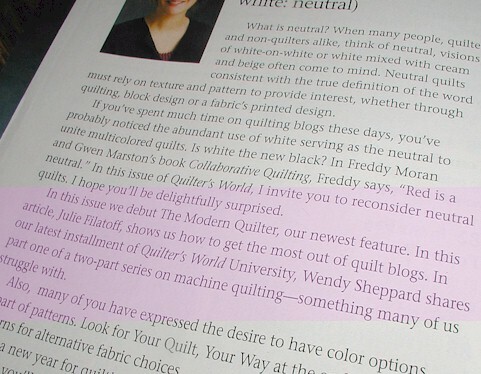 This article is Part 1 of a 2-part series on quilting I had the honor to write for Quilter’s World. 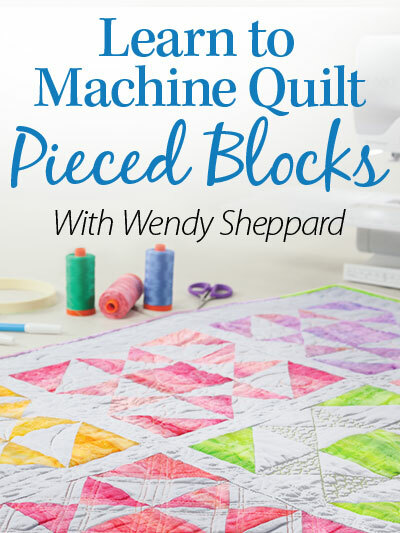 It is a four-page spread covering the different aspects of machine quilting a pieced quilt. 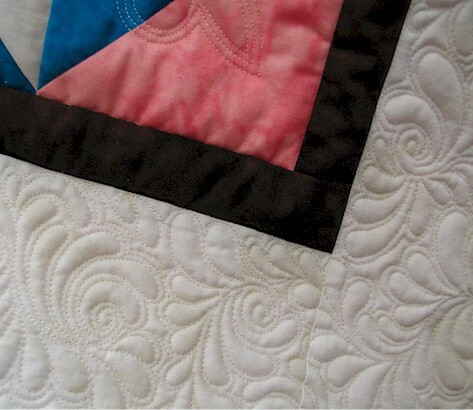 I sought to answer the questions I ask myself when it comes to quilting a quilt – do I want to 1) emphasize the designs of the pieced blocks that make up the quilt, 2) create the effect of an overall texture, or 3) create an attractive texture that also highlights the piecing? This was a most fun project because it is my first technique-based article. It was a little different from my regular design-based projects. I was challenged to get out of my comfort zone and think a little differently on how to present a technique in-print. I learned a lot! Thanks for stopping by. I wish you much fun and creativity in whatever you do this year! Blessings. 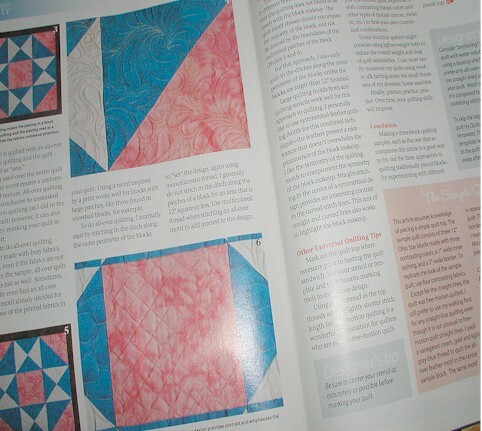 This entry was posted in Quilting, Quilts & Projects: Published and tagged Quilter's World Feb 2011, Quilting Around the Block, Quilting Tips, Wendy Sheppard. Bookmark the permalink. 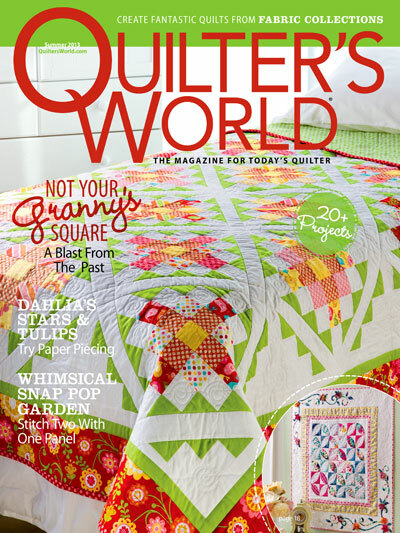 I just now downloaded my digital copy of Quilter’s World and discovered your article. OMG! You are brilliant! What I love most are the details you provide us in your posts. I sincerely thank you so much. Ginormous hugs! I’m going to go downstairs tomorrow and look for the magazine at the bookstore! That is definitely an article I’d like to read! I will have to go to my local store to see if they have it in stock. I hope so!!! If not I will have to search around town. Can’t wait to see it. This past weekend we took down the Christmas stuff, Jim and Jesse completed a project in Jesse’s room, we played together on Jesse’s Kinect — one of the few video game systems I can play that doesn’t bother my eyes — and I worked a bit on my cross stitch WIP. I’ve been thinking I need to post a photo of the progress since….whenever was the last time I posted a photo, LOL! 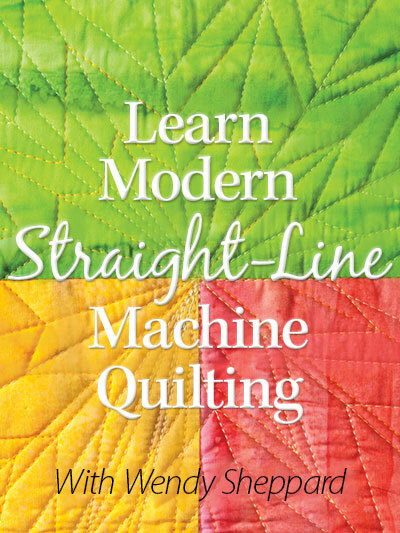 I think it is neat you write an article about machine-quilting technique. I am sure it will be helfpul. Cant wait to get a copy of it for myself. Wow, Wendy. How exciting for you. The only place I can look for the magazine is our local Walmart. It’s good to know that if they don’t have it I can download the e-version. Congratulations! And I can’t wait to hear/see more about your book proposal. Thank you for sharing such great pictures. I will go to my local JoAnne’s and pick up the magazine. You do beautiful work. 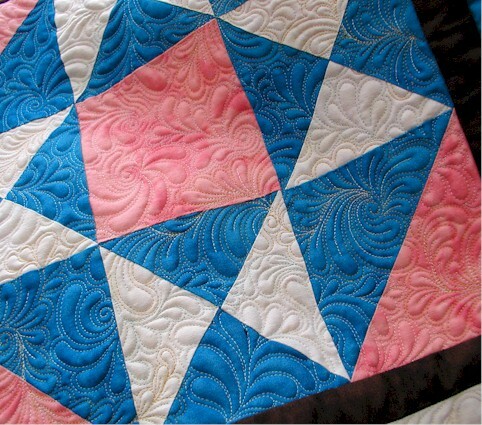 I’ve been quilting for a while but have not had the skill to try feathers yet. I quilt all my own quilts on a domestic machine. Am going to attempt feahers this year even if it kills me!!!!! Yay Wendy!! I am waiting to get mine in the mail, it should be here any day now! As soon as I get it I know which article I am looking for!! How wonderfrul Wendy – great – I must check out the e.book Looks fantastic! Congratulations on the big feature, I’ll have to see if I can get hold of it. 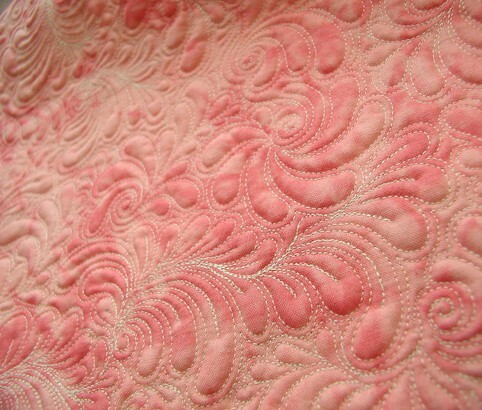 I’m oggling your quilting, it’s my favourite design that you do with feathers. Congrats girl, it looks wonderful – I’ll have to look for the magazine! 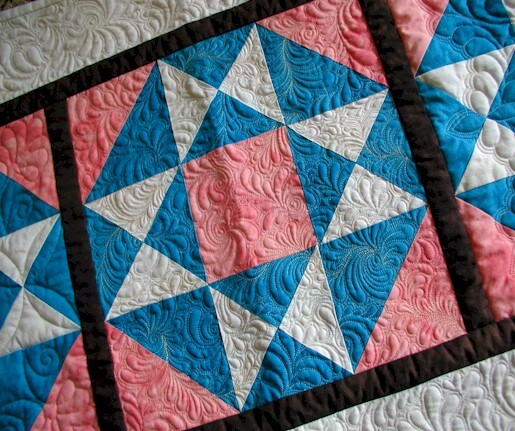 I have said it before–your quilting is amazing. How do you get your inspiration for the designs? I look at a piece and see nothing, so I usually just do an all-over design. My imagination just does not kick in. Again–amazing!!!!!!! I am going to try to find this magazine!!! Will let you know after I find it! Boy for sure there will never be any dust under your feet, fingers LOL. I will look for this issue when I go out today. 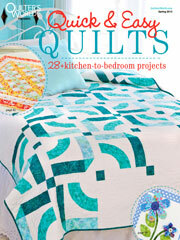 Looks very interesting and I just drool when I see your marvelous quilting. Way to go girl. Well, you know I am PROUD of you, Wendy! YEA! Way to go! I hope you will drop by and enter my china drawing. I’d love for you to have a shot at winning! Happy New Year. Thank you for sharing these gorgeous pictures. I am going to go to B and N to see if they have the article. To me technique articles are more important than projects. There are so many projects, but I like to be individual in them. However there is something to be learnt from every technique article/book. 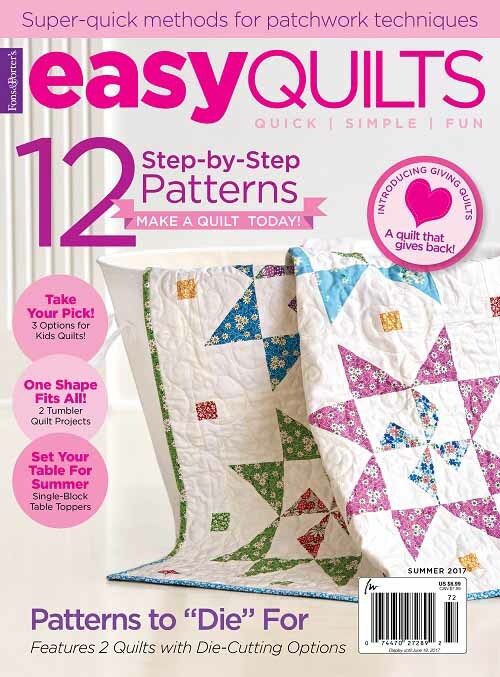 This is the only quilting magazine I subscribe to. You can imagine how excited I was to find your article. I have read every word. 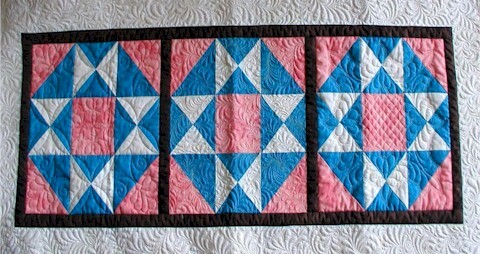 Just can’t image me ever putting quilt blocks to gether that well much less being able to quilt anything like that. It does give me something to reach for. I truly enjoyed every word. 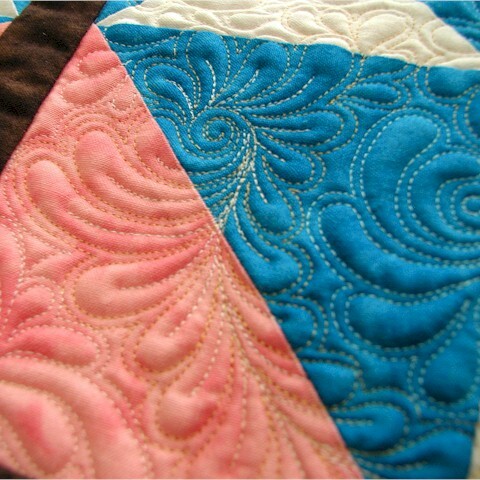 Gorgeous quilting! I look forward to reading the article. 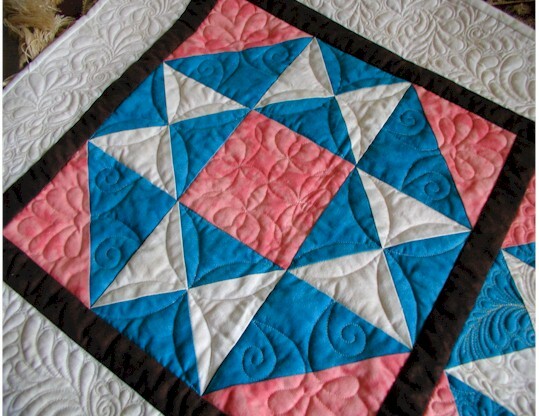 I can’t believe you just started quilting in 2005. Wow. And already writing book proposals. Hi! I just found your blog & was pleasantly surprised to see that you wrote that article! I really enjoyed it & put a stick note on it for future referance. Great work~thanks. Wendy,you’re just a shooting star! 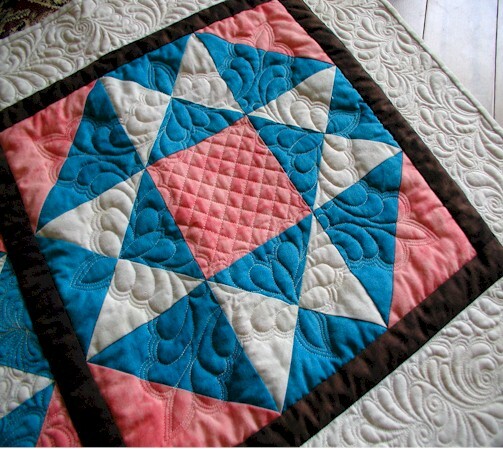 I love that quilt, no wonder you are being featured. Book proposal? That sounds exciting! Congrats on your latest success, it is well deserved. 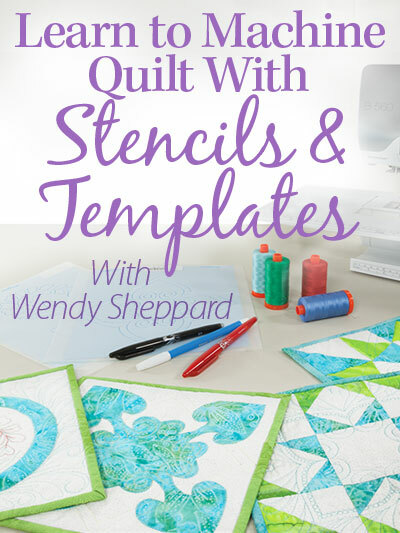 What an inspiring quilter you are! I can’t wait to see a copy of this magazine to read your article. Thanks for all the beautiful designs and the “eye candy”.